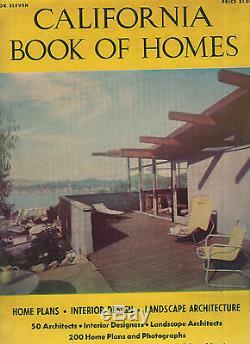 CALIFORNIA BOOK OF HOMES #11 RARE 1950S ATOMIC RANCH EICHLER HOUSE PLANS VINTAGE very hard to find 100 page great collection of house plans and photos of real California mid-century modern homes and articles about how they were built, with features and problems encountered! 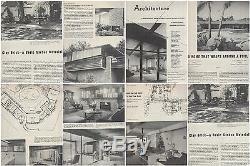 Some classic, iconic homes here Neutra, Lautner styles here, many architects and developers of the era Eichler, Eames, Post & Beam, Shed Houses, Flat Roof, Butterfly roof, Palm Springs, So Cal, Bay Area, all over! A great find, independently published in book-mag format with Ring Binding. ONE MAGAZINE COST FOR INTERNATIONAL FIRST CLASS WITH TRACKING BAR CODE IS 11.95, 6.95 for Canada. 2 or 3 MAGAZINES FOR INTERNATIONAL FIRST CLASS IS 18.60, 12.95 for Canada. 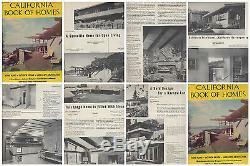 The item "CALIFORNIA BOOK OF HOMES #11 RARE 1950S ATOMIC RANCH EICHLER HOUSE PLANS VINTAGE" is in sale since Tuesday, August 22, 2017. This item is in the category "Books\Magazine Back Issues". The seller is "wvclicker" and is located in Atlanta, Georgia.